I design, carve, and cast the pieces myself. I cast them in modified gypsum with bronze powder. The pieces come boxed, can stand or hang (there's a hook on the back), and can go outside. Each piece comes with a history card stating: "For much of the seventh century, St. Amand preached the gospel in northwest Germany, Belgium, and the area surrounding Bordeaux, all areas where fine wine and beers were and still are made. Walking and preaching in these areas, Amand would have gotten to know those who worked at all levels of making and selling wine and would have regularly blessed them. We can assume also that, like the one whose gospel he preached, he would have participated in the drinking of the wine that was made by those to whom he ministered. Amand also established a number of monasteries that produced wine and beer, both of which were consumed by the monks, even during times of fasting. For these reasons, Amand became the patron of wine, wine-merchants, wine drinkers, and tavern keepers. St. Amand's name has also been kept before the world because of its association with, for instance, the fine sauternes made by the Chateau St. Amand in the Bordeaux region of France. (A fine ale called St. Amand country ale is made along the border of France and Belgium.) 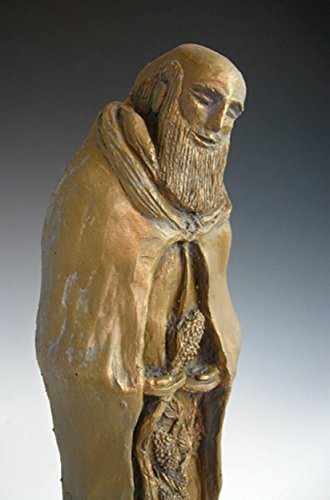 This statue of St. Amand, in the process of cutting a cluster of grapes from a vine, was handmade by Hank Schlau and hand painted by Karen Schlau." Dimensions: 8 inches (h) x 3.5 (w) x 2 (d). If you have any questions about this product by In the Company of Saints, contact us by completing and submitting the form below. If you are looking for a specif part number, please include it with your message.